It’s a warm summer evening in the Pacific Northwest, and I’ve taken my grandmother out for a little dinner date for one of her favorite foods in the world: hamburgers. You should see the way that her eyes light up at the sight of a perfectly cooked burger, a look that would bring a smile to anyone. As we scan our menus, it feels exactly like old times, simpler times. Quickly, however, a puzzled look takes over her face and, with a single question, I am brought back to reality. My grandmother has been living with Alzheimer’s disease for the past decade. Many years have passed since then, and as a first-year medical student, I have been fascinated every time we learn something new about the brain. While the specific causes of Alzheimer’s are still not completely understood, my grandmother’s experience with the disease has both helped me put some of what we have been learning into context, as well as helped raise a lot of internal questions. As future physicians, what is our role in caring for those struggling with dementia-related illnesses? As a grandson, how do I best support someone who I love and care for very deeply? I’m not going to pretend that I have those answers, because I don’t. 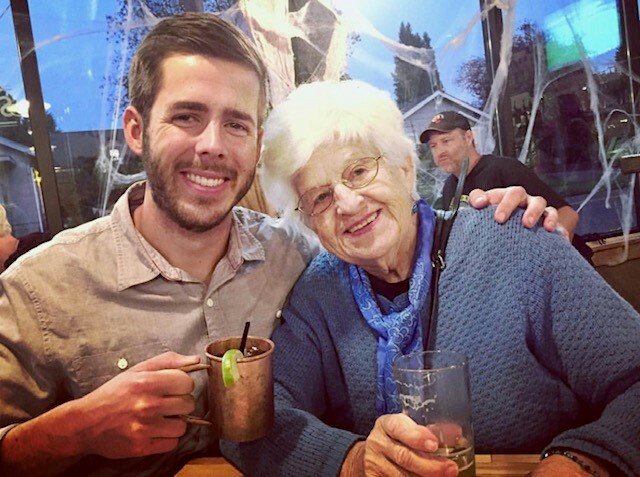 Rather than answers, I have experiences, and lessons that I have learned through spending time with my grandmother that I think can be applied in both settings. First and foremost is patience. Caring for someone living with Alzheimer’s tests your patience in unimaginable ways, as the repeated questions and general forgetfulness can certainly be trying. That being said, I would not trade the time that I have spent telling my grandmother for the hundredth time that “yes, grandma, I did graduate from college” (5 years ago), or “no grandma, I’m not married yet.” I truly believe that the time we spend with her is comforting, and while she may not be able to express it, that comfort and human connection is as impactful as any drug or therapy. Another lesson that my grandmother has taught me is forgiveness. Just as my grandmother has done, I have learned to forgive myself after feeling guilty spending so many years away from home in school, and not being able to spend as much time with her as I would like. I have learned to appreciate the moments that we do have together and accept the fact that I cannot be there for her all the time. Moving forward, I hope to keep these lessons close to my heart as a future health care provider. In today’s society, I feel like patience and forgiveness are too often forgotten -- qualities that can go a long way in achieving positive health outcomes and establishing mutual levels of trust and respect with your patients. In the meantime, I’ll continue to enjoy dinner dates with grandma whenever I have the opportunity. Now, can you please pass the ketchup?